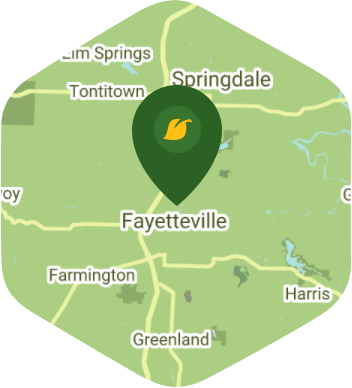 Looking for lawn care services in Fayetteville, Arkansas? Look no further than Lawn Love. Get an instant quote on lawn care services such as lawn mowing, leaf removal, gutter cleaning, yard care, lawn aeration and more. We're rated the #1 lawn care service company in Fayetteville, Arkansas for a reason. Read our reviews and book today. Your lawn will thank you. As the home to the largest University in the state, Fayetteville is no sleepy city in the South. From sports to music to arts, there are so many opportunities to be entertained in Fayetteville. When you have time to do the things you enjoy with the people in your life that matter, the last thing you want to is work on your lawn. But if you don't do it, then who will? The answer to that question is Lawn Love. Lawn Love is a fully insured and bonded lawn care company. Our teams of experienced and skilled lawn care technicians want to work with you to create and maintain a lawn that feels like home. We can take care of all your lawn needs, from mowing and trimming to weeding and seeding. There's no job too big or small for the lawn care pros at Lawn Love. To find out more about Lawn Love's services and take advantage of our free, fast and easy two-minute quote, give us a call today at 501-406-2264. Rated 4.75 / 5 stars in 100,645 Lawn Love customer reviews. It looks like the expected precipitation in Fayetteville is 0.15 inches, which means your lawn got a nice soaking—leave those sprinklers off today. Dusk and dawn are the best times to water your lawn (the sun will rise at 6:32 AM and set at 7:57 PM today in Fayetteville).